In 2010, shortly after I graduated college, I met a cat named Smirnoff. And what seems so crazy to me now, five years later, is that on the day I adopted him I had 1) never stepped foot inside an animal shelter before and 2) knew very little about cats. I mean, I knew one thing. I knew that cats were generally considered to be pets. I had even met a very friendly one once while babysitting for a neighbor, so I knew that once in a great while, a cat might like to sit in a lap. But that was about it. Yet here I am, in 2015, employed as the regional foster coordinator for one of the nation’s largest no-kill organizations. I spend 40+ hours each week in an animal shelter, and can tell you more about cats than you could ever really care to know. No, really. I know, for instance, that a cat with extra toes is called a polydactyl. I know the names of all the different cat coat types, and the difference between a tabby mackerel and a tabby classic. I know that cats are induced ovulators (just like rabbits), which is one reason why we have so many strays and kittens. I know that cats are lactose-intolerant despite loving milk, that they produce pheromones to mark their territory and to make things smell more familiar (which is why they love having their cheeks and chin rubbed), and I know how to calculate the stomach capacity of a neonatal kitten. In addition to Smirnoff, I have two other adopted cats (and, miraculously, also a boyfriend), and live 3,000 miles away from where I began this journey. I’ve met Jackson Galaxy twice, volunteered/worked with four different rescue organizations, started a youtube channel, a podcast, an instagram feed and… oh yeah, I have met thousands of cats. Literally. Thousands*. And it’s only been five years. So it’s with a little bit of awe that I look back on the journey that got me here. It’s too much for one blog post, so I will break everything up into different topics, because let’s face it – not everyone will want to read a million paragraphs about cats in one sitting. So be on the lookout for many more blog posts coming soon (and hit “follow” if you don’t want to miss any of them)! 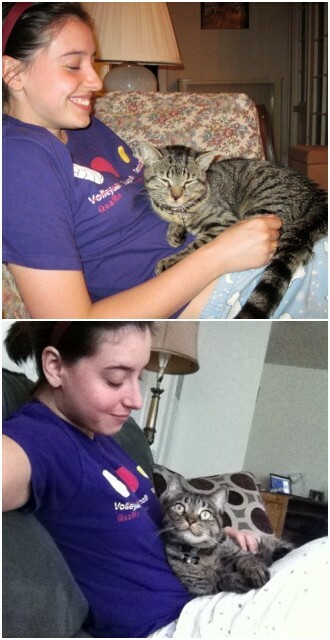 Myself with Smirnoff in 2010 (top) and 2015 (bottom).